Decorative Armour has adorned castles, palaces and homes for centuries. Decorative Armor is an exceptionable symbol of Historic and Noble times that can be adapted to any interior decor. We are proud to offer a full range of Full size and miniature decorative suits of armour. We also carry decorative breastplates, gauntlets and suits of armour. Much of our armour is handcrafted in Spain and are the best replicas you can find. Their unrivaled quality and historical authenticity makes them a valuable and impressive collector item! Selection of Decorative Breastplates. 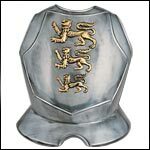 Decorative Steel Breastplates make an impressive addition to any medieval or renaissance décor. Many decorative steel breastplates are made in Spain and are the best replicas you can find. Decorative Medieval Gauntlets, Mitten Gauntlets, Finger Gauntlets, Steel Gauntlets, Engraved Gauntlets and Embossed Gauntlets. Many of our decorative gauntlets are handcrafted in Toledo Spain and are the best replicas available. In our Decorative Armour section, the most impressive armour is our full size suits of armour! These noble and enduring symbols of the knightly age come partially assembled and are ready to enhance your own castle entrance. Miniature Suits of Armour are scale Replicas of European suits of armour from the 15th and 16th centuries. We carry versions of miniature suites of armor that are fully articulated to one third scale. Complete with display stands.